Last night, I was reading a couple of food blogs while hungry, which is akin to shopping while hungry. 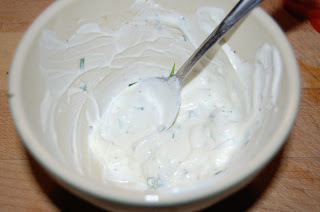 In the process, I ran across this post from Sweet Pea Cooks. 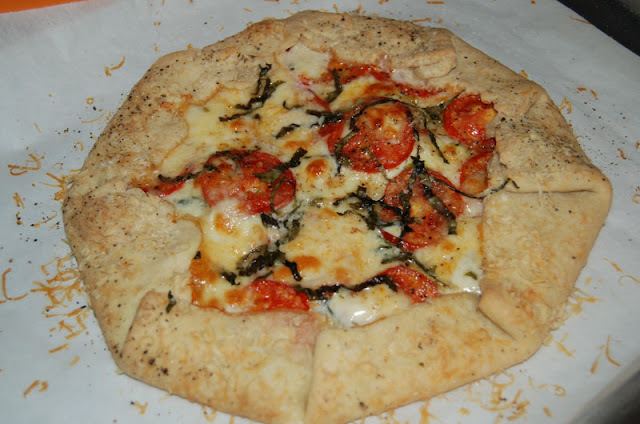 In the post, she talks about a recipe for a Tomato Tart, partly based on a David Lebovitz. recipe. Needless to say, I went right into the kitchen, grabbed a couple of fresh tomatoes from my garden that have been piling-up, and started working on my own version--not really sure how it was going to turn out. The result was surprising and my wife asked for more--something that's really a rarity. There will be absolutely no leftovers to be had today. She also inquired as to whether I would remember the recipe, "for next time," something I'll admit I don't always do. Luckily, I took photos and I'm going to share it with you. Note: You can substitute any veggies you like on this but I recommend that you keep it to one or two and that you choose items that can be sliced very thinly so they'll cook in the oven. 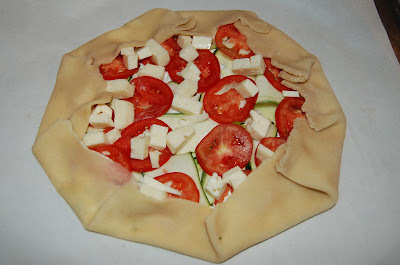 This isn't a pizza and weighing it down with heavy stuff will not work well--the pastry just can't support it. In a small bowl, combine the mayo, sour cream, and 3/4 of the basil, chopped. Add some salt and pepper to taste. 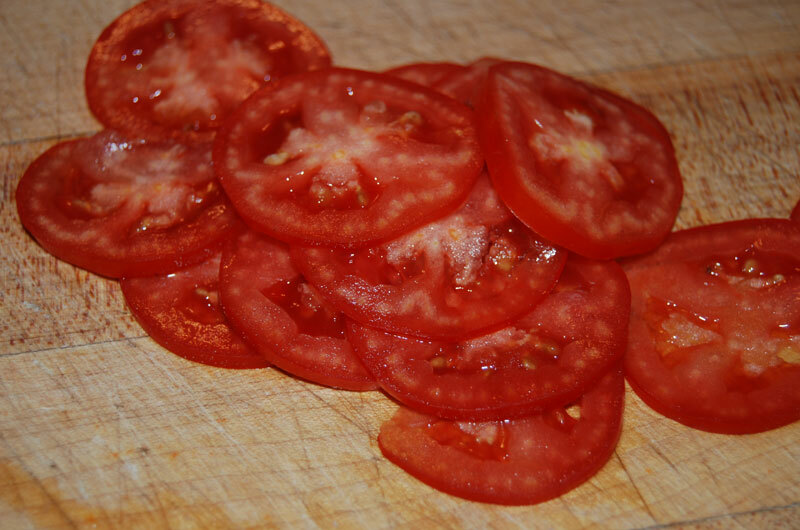 Slice the tomato as thinly as you can. Using a vegetable peeler, slice the zucchini the long way into ribbons. You only need enough to cover the tart--you won't use the whole squash. Try to avoid hitting the seed pockets like I did. You can rotate to the other side if necessary. 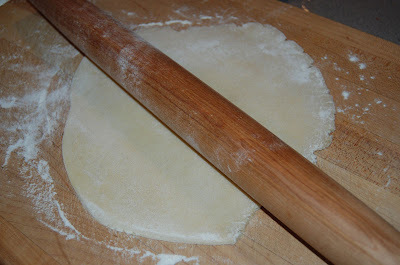 If using homemade pie dough, roll it out thinly. It's okay if it isn't perfectly round--this is a rustic tart. I actually used half of a one-crust pie recipe here and it was plenty for the two of us. If using puff pastry, thaw according to package directions and roll out thinner on a floured surface. Dock it in the center (poke it with a fork) so it won't puff up under the filling. Transfer to a parchment-lined baking sheet. 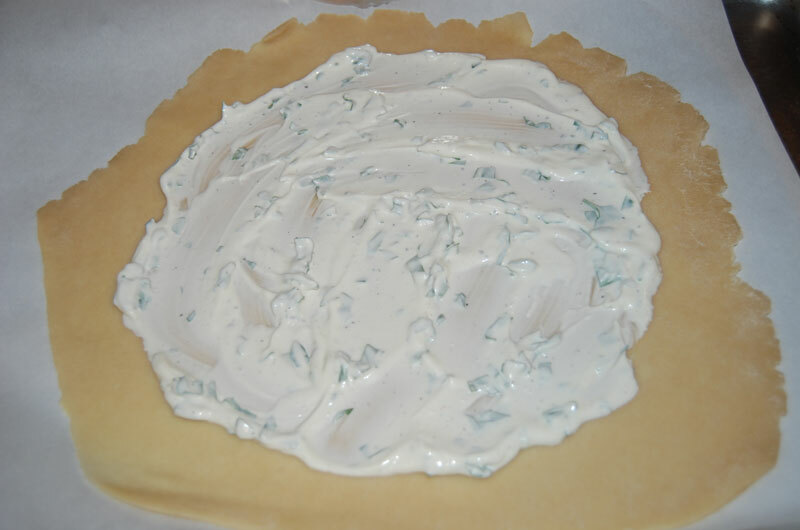 Spread the mayo mixture into a thin layer on the center of the dough. 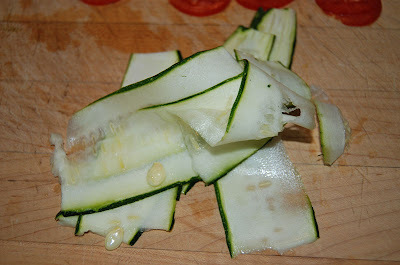 Place the zucchini ribbons on top of the sauce, looping them a bit so that you don't end-up with a big flat layered look. Start layering the tomatoes on top. Once you've layered the tomatoes on, add the cheese. Here, I've cubed it but shredded is fine. Fresh mozzarella would have been even better. This is the part that looks way harder than it really is. Start turning the sides up, one section at a time, working around the tart. It doesn't have to be perfect--again, this is a RUSTIC tart. 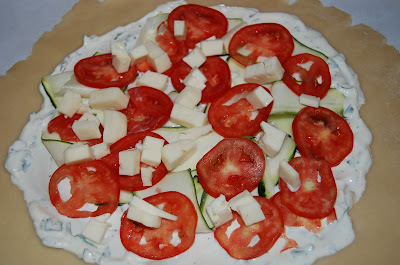 Drizzle some olive oil on the filling. I put olive oil on the crust too but, in retrospect, an egg wash would have worked much better and been much prettier. 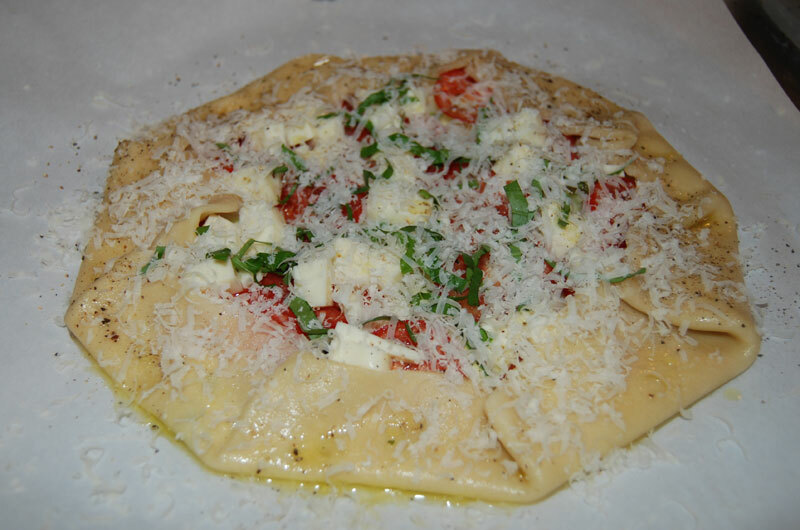 Sprinkle the whole lot of it with grated Parmesan. 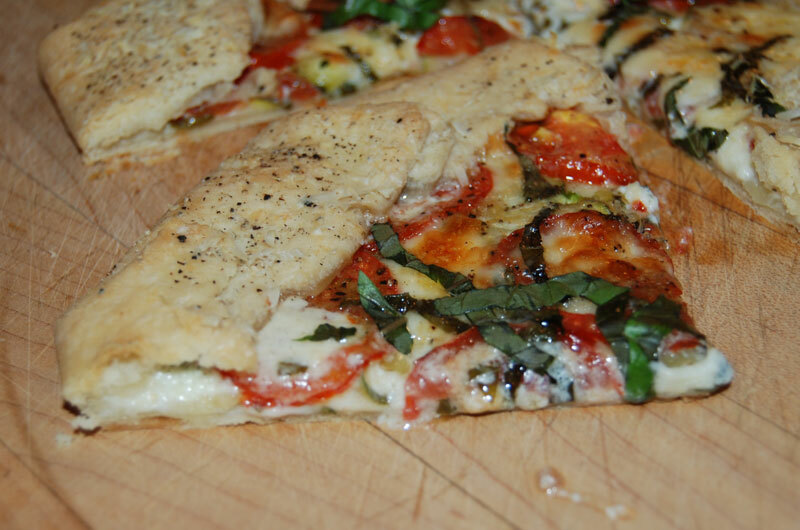 Remove it from the oven and sprinkle the remaining basil on top. 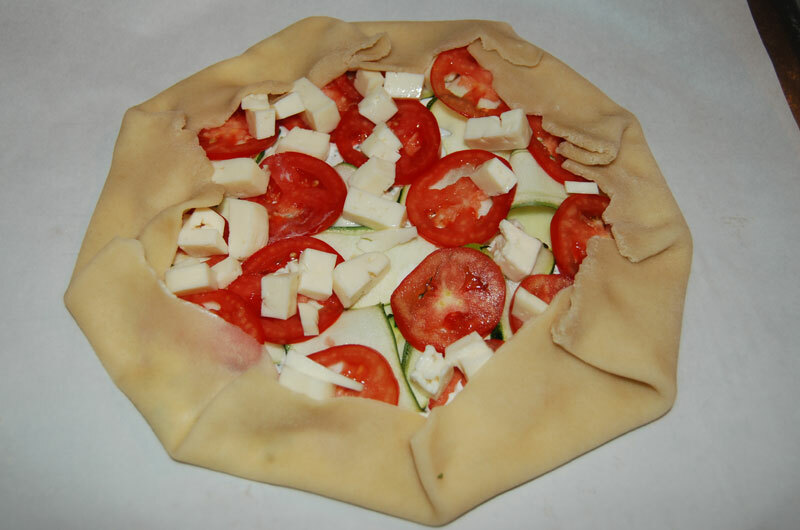 Let it cool a bit before slicing like a pie/pizza and serving. It actually tastes great luke-warm, so it'd make a great dish for a buffet, brunch, or other party where you don't want to be a slave to the kitchen. 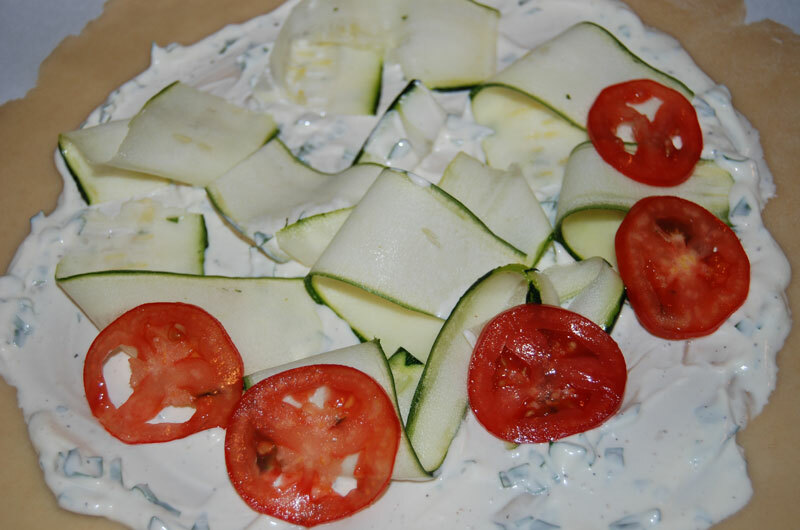 It'd also be great for lunch with a small salad, some sliced cucumbers, or even more fresh tomatoes. I emailed your post to Jon yesterday and came home to a tasty tart. Thanks for sharing the inspiration! You're very welcome! I'm happy to share... Did he make any interesting changes to the recipe? I would totally make that. Tomatoes are one of my very favorite things to eat in summer, and who doesn't love cheese?!? The bottom of our crust got a bit soggy when the zukes let off their moisture and the zukes tended to slide out in whole chunks. So if we make it again, we'll probably cut them in shorter pieces and maybe use fewer.